Providing each employee access to their own records can help motivate and empower them to improve performance. They can access their data via their own computer or tablet, central kiosk or touch screen terminal. The data can also be linked to your existing LAN, WAN, and/or Intranet or else be disseminated via the Internet (using VPN technology) to your employees' homes. With 128-bit encryption, you can be sure that the data is secure and only accessible to the intended users. Each employee has their own unique user ID and password and set-up with different permissions to various elements such as the clock card, or holiday request, ensuring data security. The self service module allows employees access to their clocking data for the current week, review holidays taken and booked and see all absence details and flexi balances where applicable. They can also request holidays, give reasons for historical absences and send messages to other users. Upon requesting any of the above, line managers can choose to either decline or accept the employee's request with decisions and updates being recorded in real-time. Employees can also clock in and out utilising this module, which, like all our software, has been designed to function in such a way that it can be configured around your individual requirements. The overview screen provides an at a glance view of the current system position for the employee. Included in the brief is clocking data for the day, their current fire register status and allotted fire assembly point, holidays remaining, current or next shift pattern, a photograph and flexitime balance where applicable. Since some employees may be home-based or work at remote locations the system can help you keep track of their current status. By enabling the clocking feature, employees may use this module to clock in/out via a PC or any browser based smartphone. The transaction time will be recorded using data based on the time on the server, as opposed to the local device. Employees are also able to view their clock card for the current or any previous week and the screen clearly displays their transactions and any amendments made by the manager, complete with a reason as to why the change was made. Their hours worked, including basic hours, overtime, shift premiums, paid and unpaid absences are also made available and employees can interact with line management through this screen, by providing reasons for lateness or absence. This is the first screen an employee will see when they log onto the employee self service module. Company notices can be displayed here, along with unique messages to the individual. Additional links to other web-based applications can be created and placed here as needed. For a more detailed, graphical view of current status users can select the holiday and absence screen, which provides details of their current, previous and next holiday year. The screen clearly displays the number already taken, the remaining ones already booked and details of accrued unused days. Space is provided so that employees can make requests and add any additional comments they might think pertinent to their request. Sometimes an employee requests a holiday that is rejected, for whatever reason. In these instances, a report is available, within the Time and Attendance modules, that will correlate any absences on a day where a holiday has been declined. The ability to double check shift details at will has obvious benefits. This screen allows employees to view a historical overview of shifts worked, and review shifts they have been scheduled to work in the future. In addition, requests to change a shift can be made directly from this screen. When a change of request is made by an employee or supervisor, notifications of authorisations and rejections will be sent to concerned parties automatically. In addition, when the manager/supervisor next logs into either E-Manager or time and attendance, they will be notified of any unauthorised requests, thus not only reducing the paper trail but also retaining a full electronic audit. Where operated, flexitime can be one of the more difficult things for an employee to manage effectively. This screen offers a clear and precise overview of the employee's flexi balance. The data set includes paid absences, unpaid absences, total hours, core hours, lost hours, supervisor adjustments, previous period's balance and time carried to the next period. With this screen, you can access an employee's personal details including their full name, date of birth, address, contact telephone numbers and emergency contact details. Employees can have their permissions set to allow this screen to be editable, thus devolving the update of the records to the employee. 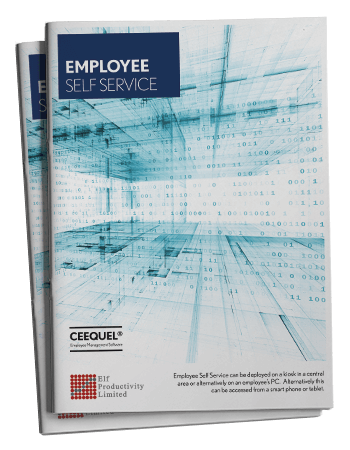 Where you are utilising the employee tracking module from Ceequel®, you can allow employees to move from activity to activity from self service, thus accumulating hours by a particular activity or job. Sometimes information is considered too important to be labelled as a simple notice, though the notice board can certainly be used to bring attention to it. This screen allows users to deploy critical documentation to specific employees or your entire workforces as you see fit. Information, such as health and safety updates, employment contracts and Return To Work documents can be uploaded and assigned with different requirements such as accept, decline or email for review later. Reports from the main time and attendance system can then identify those employees who are yet to accept or have declined certain documents. All of the key features in our Self Service module can also be found in our iPhone Application, which is available from the Apple App Store.